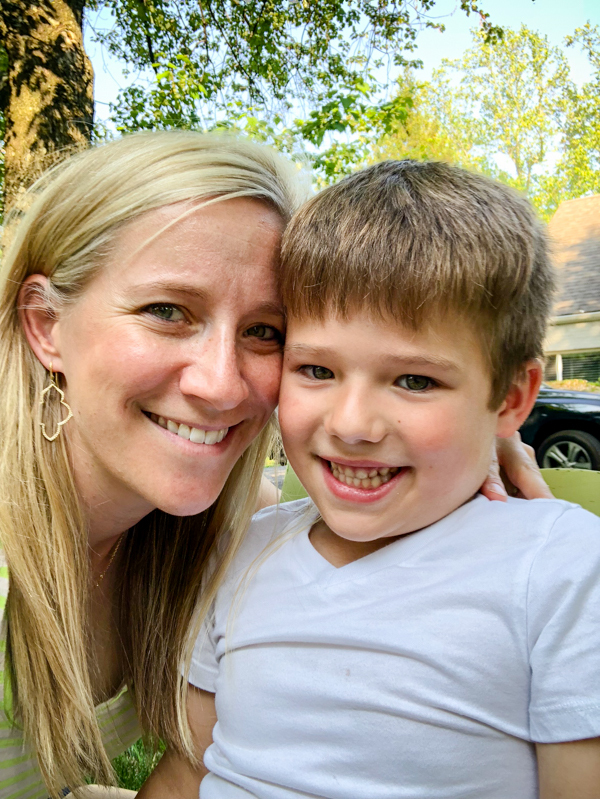 I recently started a weekly Instagram Live series on Thursday afternoons where I answer questions from blog readers and social media followers. I realize not everyone catches them before they disappear in 24 hours, so I thought I’d share them on the blog too. I hope you guys like this new feature – and please send any questions you might have for future episodes! 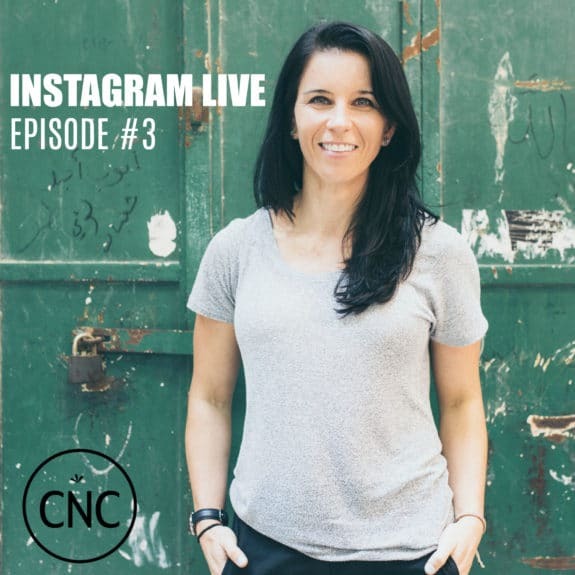 The post CNC Instagram Live #3 appeared first on Carrots 'N' Cake. 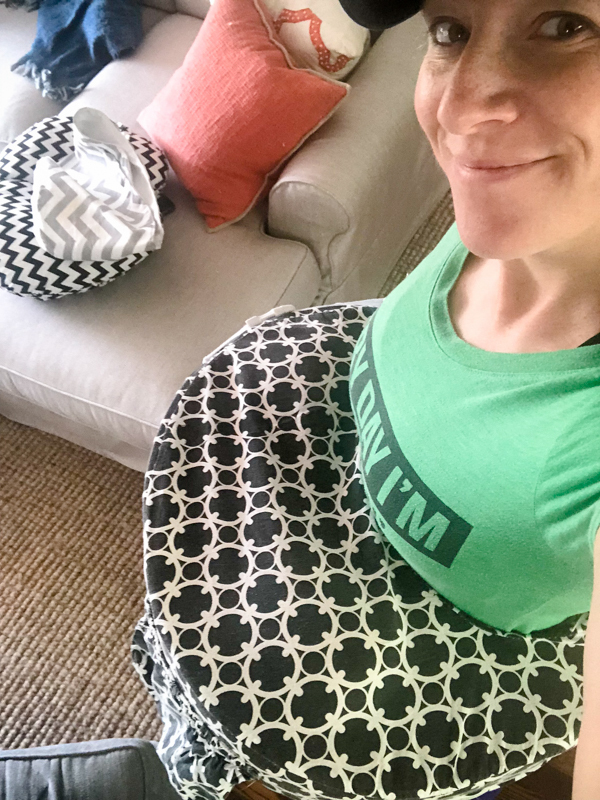 Even though it’s only been 3 weeks at OPEX, I’m already starting to feel some positive changes in my body – like feeling both sides of my lower back touching the car seat when I’m driving and sore abs on my RIGHT side, which has probably never happened ever. My left side is always super tight and angry, so it was a nice change. Things are definitely happening, and I’m so glad that I made this switch! If you look closely in the photo above, you can see just how built up the muscles on the left side of my lower back are. 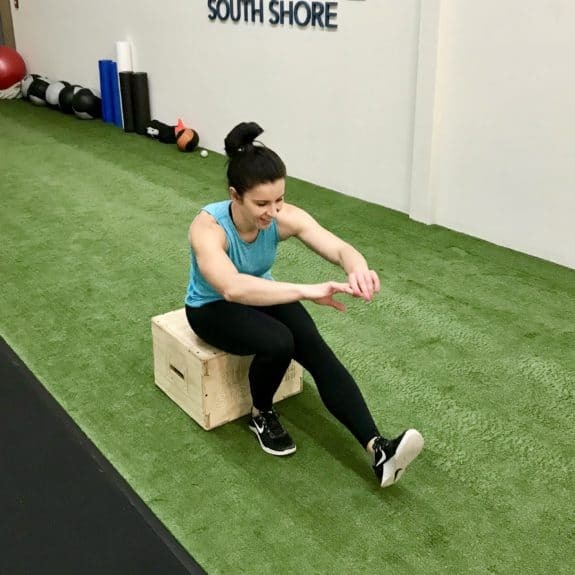 A1) Eccentric Single Leg Squat to a box <— major glute burner! 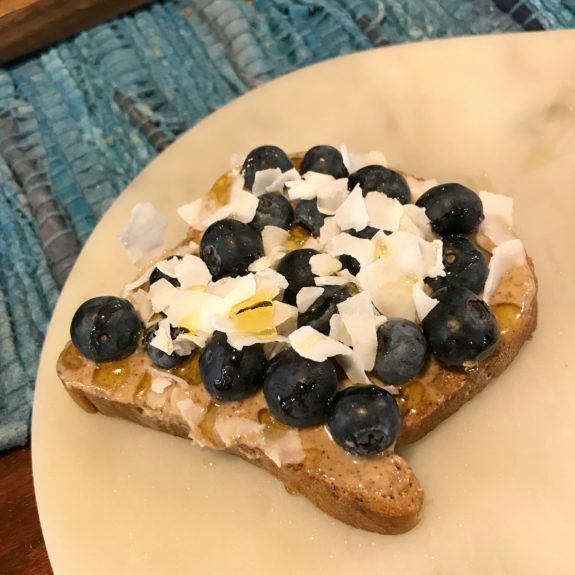 Almond butter toast with fresh blueberries, shredded coconut, and honey from Rosa Farms– So yummm! 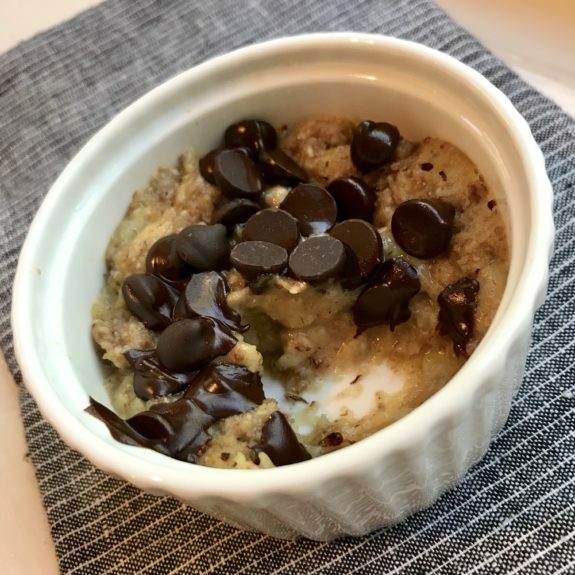 Warm Chocolate Chip Cookie Bowl – I was obsessed with this single-serving treat last week! 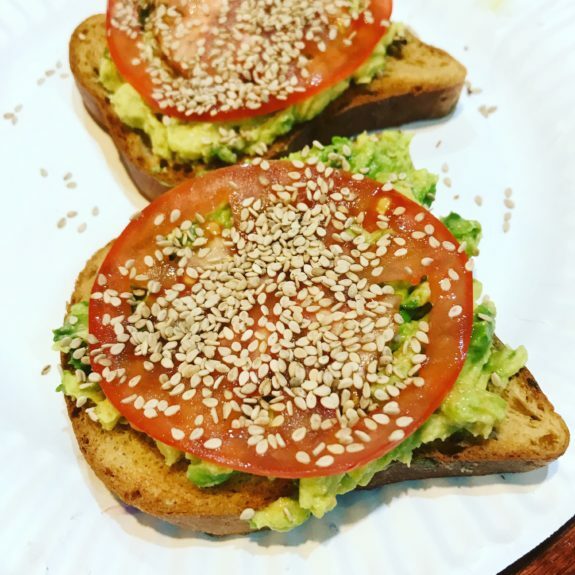 Avocado toast with sliced tomato and sesame seeds from Rosa Farms– I actually ate 3 slices for lunch the other day and, boy, was a filling and delicious meal! 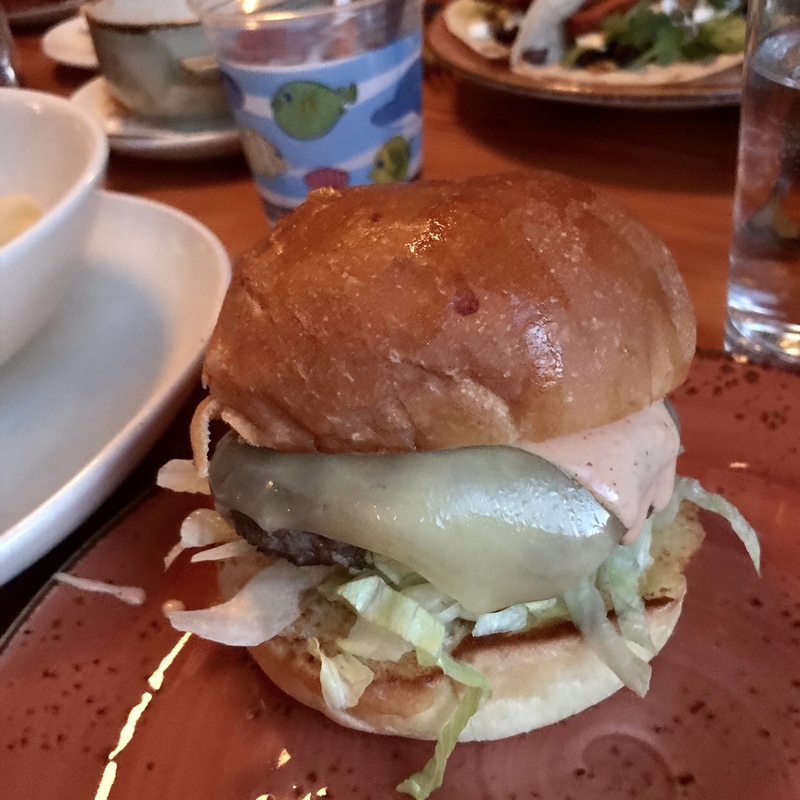 The “Doc Burger” from Doc Ponds – Made with a special sauce and Vermont cheddar. It was incredible! 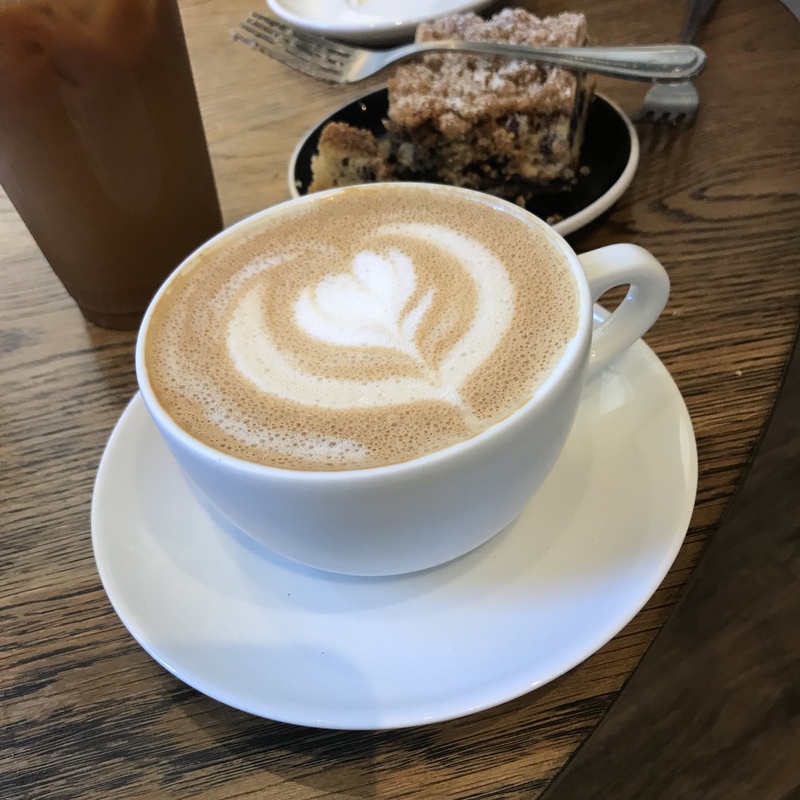 The “Devin” from PK Coffee made with housemade almond milk and maple syrup – It was basically heaven on earth with a few bites of blueberry crumble. 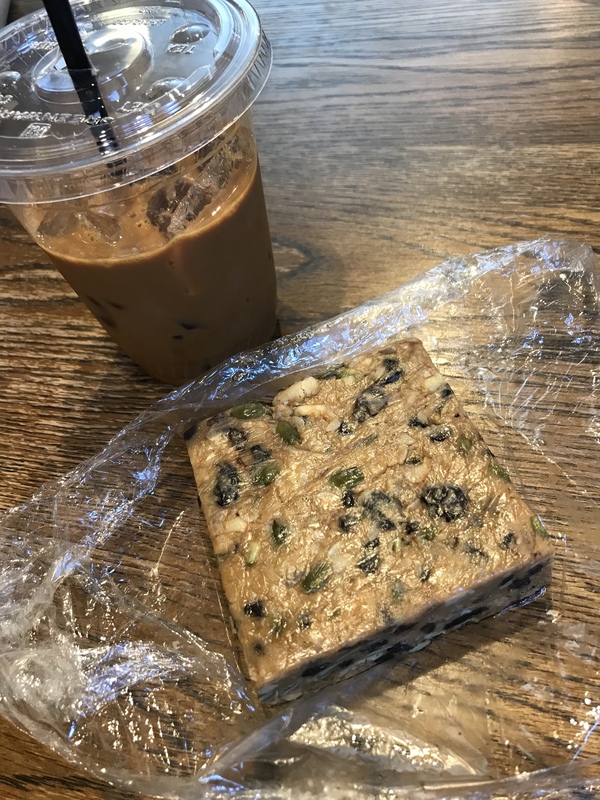 Almond butter bar from PK Coffee – I’m not sure exactly what was in it, but it was almond-butter based with honey, nuts, and seeds. I wonder if I could recreate the recipe at home? The post 5/6: Fitness & Eats from the Week appeared first on Carrots 'N' Cake. Heyyyy!!! 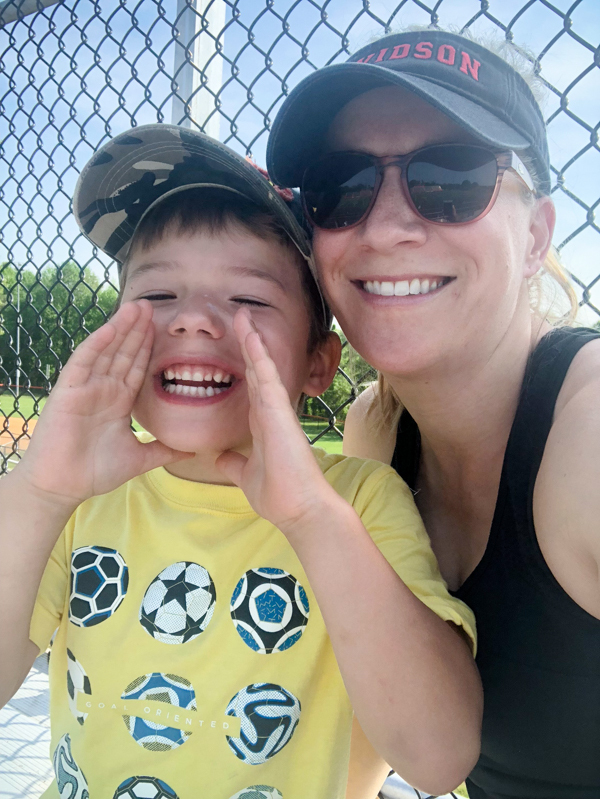 We had a great weekend and hope you did too! On Friday we took a meal to a new mom friend and then came home so Mazen could have a little bake sale. The neighbor boys have been into all kinds of roadside stands selling lemonade, garden herbs, etc, and every time Mazen joined in he tried to swipe things from our house to sell! 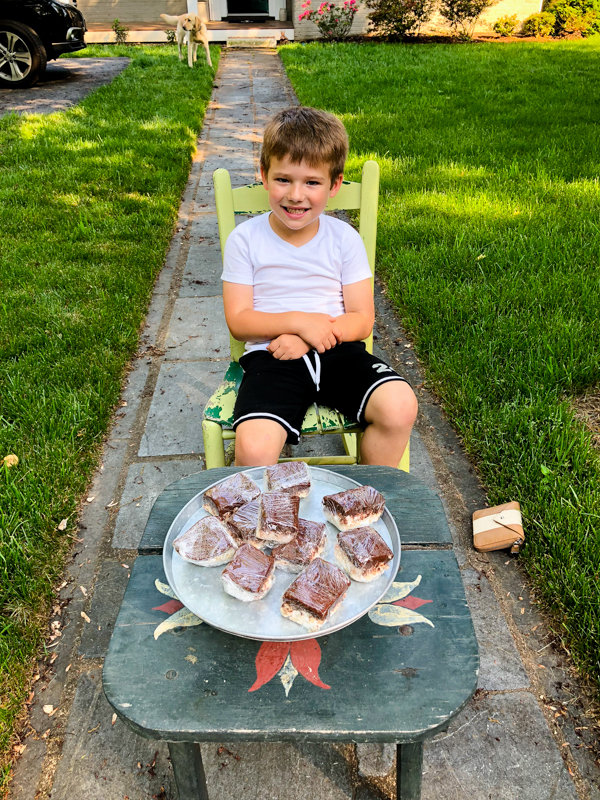 I explained to him that he had to create something to sell, so this week he and Matt made the most amazing fudge topped rice krispie treats. (Thanks to Matt for putting in the operating costs!) Mazen sold ALL TEN in a few hours. 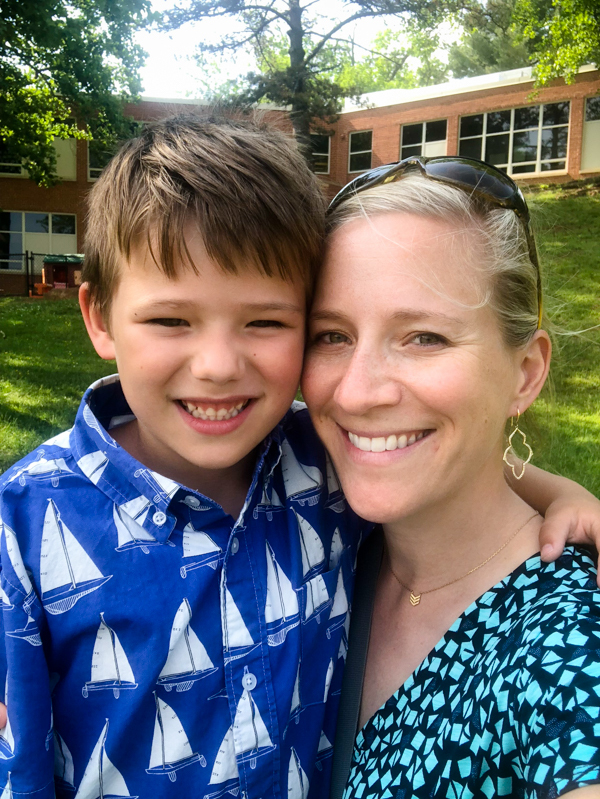 A few to strangers who pulled over and the rest to neighbors (and Thomas – lol!) Don’t worry – I was there supervising the whole time. Friday evening I made Mona Lisa Pasta for dinner with side salads. 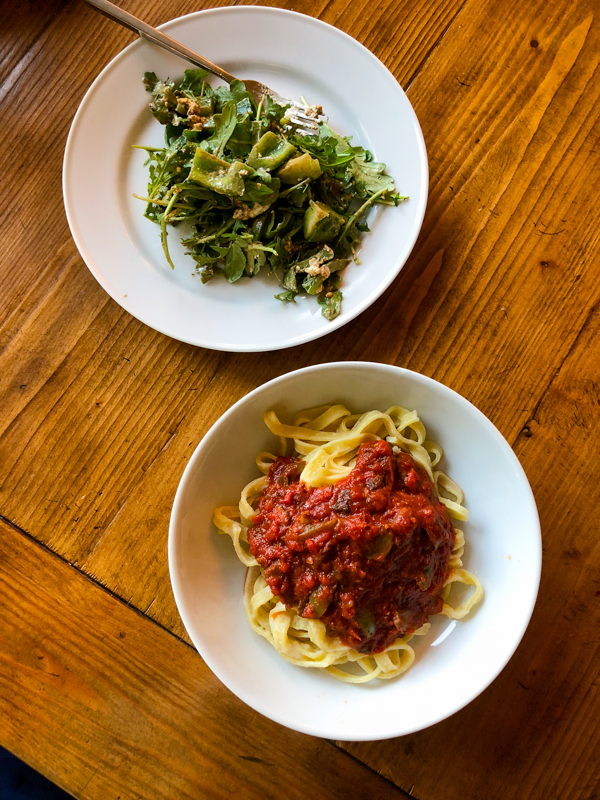 There’s nothing like fresh pasta! 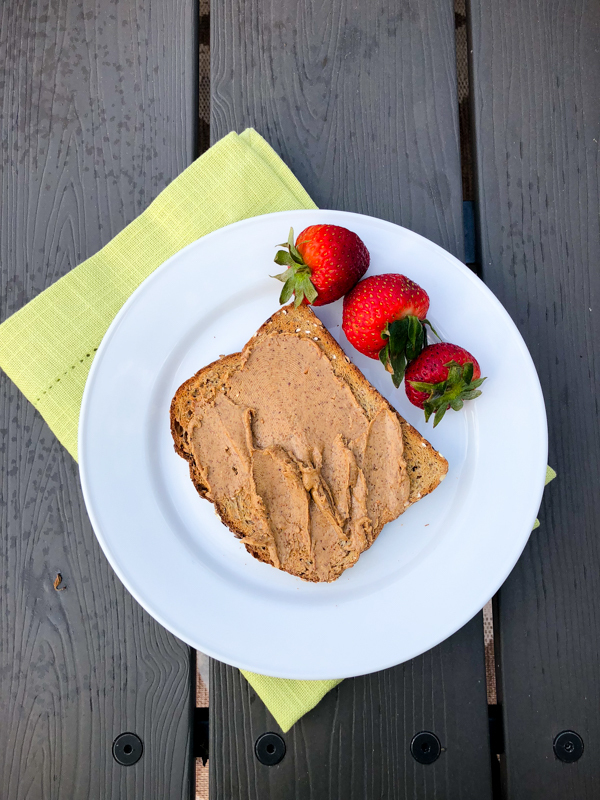 I had a quick toast with almond butter before we headed out. On the first day of soccer it was literally freezing with a horrible wind chill, and this weekend it was humid and steamy hot at 9am! After soccer we played around the house until Matt picked Mazen up for afternoon swimming. 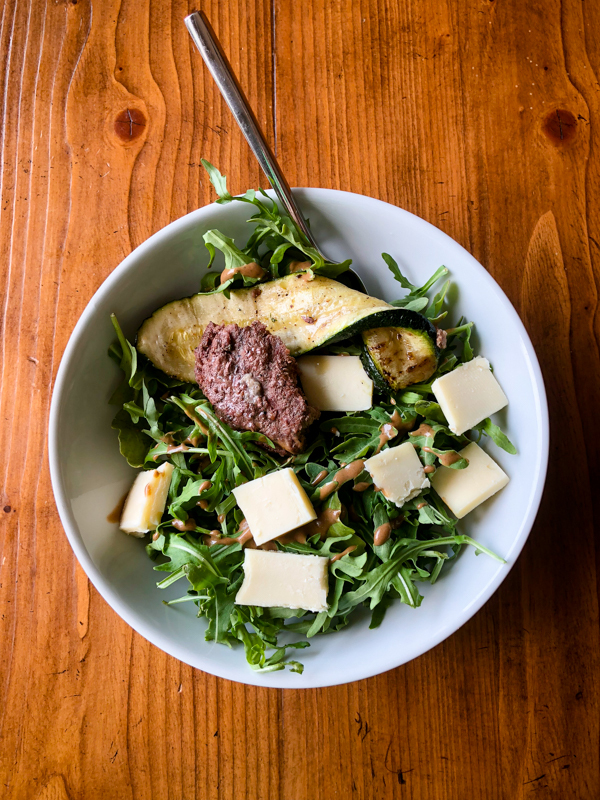 I had a little leftovers salad for lunch with arugula and a burger from earlier in the week. 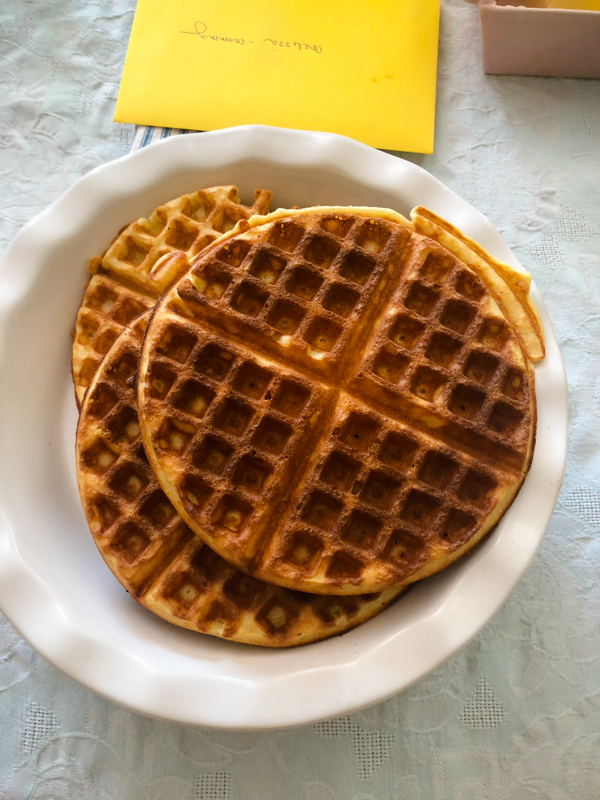 Plus lots of sharp cheddar – cannot get enough!! I spent the afternoon taking inventory of our baby stuff! I’m starting to feel a bit more ready to survey what we have and think about what we might need. Luckily I kept a lot of stuff! Saturday night Thomas and I had dinner at The Clifton (where we had our wedding last October!) 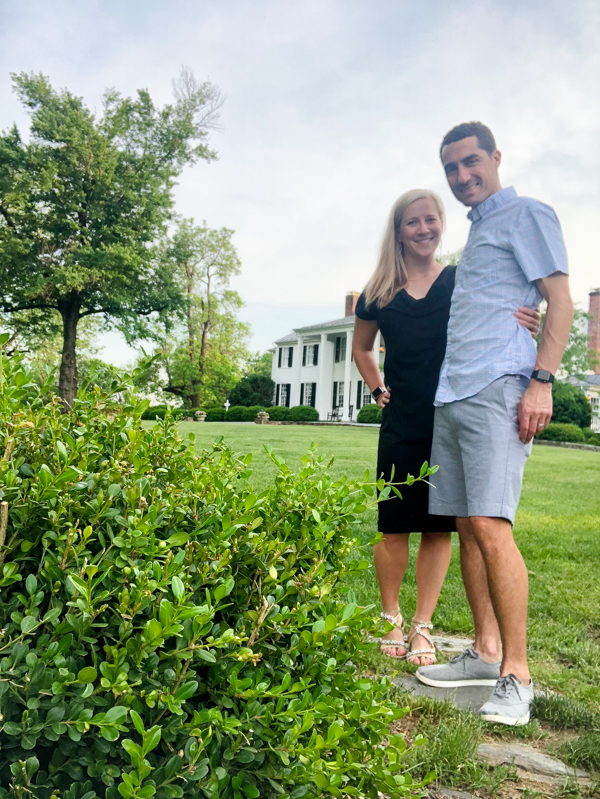 The inn changed owners right after our wedding and underwent a big renovation for three months this winter. Everything is now much swankier, but the charm and grounds are still there. It’s now known simply as The Clifton. We had dinner on the terrace, right where our reception was! It’s so special to me to live so close to our wedding venue and be able to remember the day in person as often as we like. I would love to spend an anniversary night here every fall too! Shout out to our fabulous server Kelly for taking good care of us the day after our wedding and again last night. 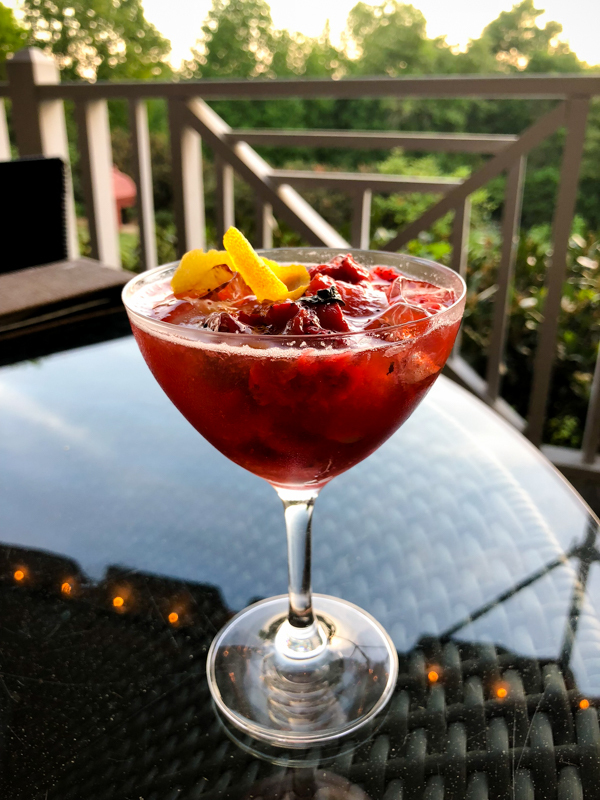 She and the bartender created this awesome strawberry smash lemon mocktail for me! And I had the most delicious halibut entree. 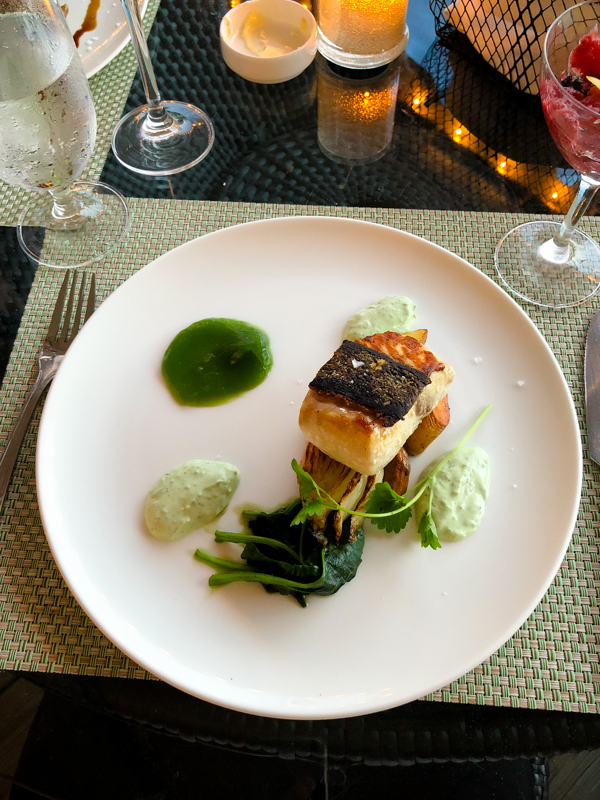 The green puddle was some kind of sweet spinach puree that made every bite so good! I loved the chive yogurt too. I am a sauce girl! I loved the caramelized fennel and fingerling potatoes underneath too. 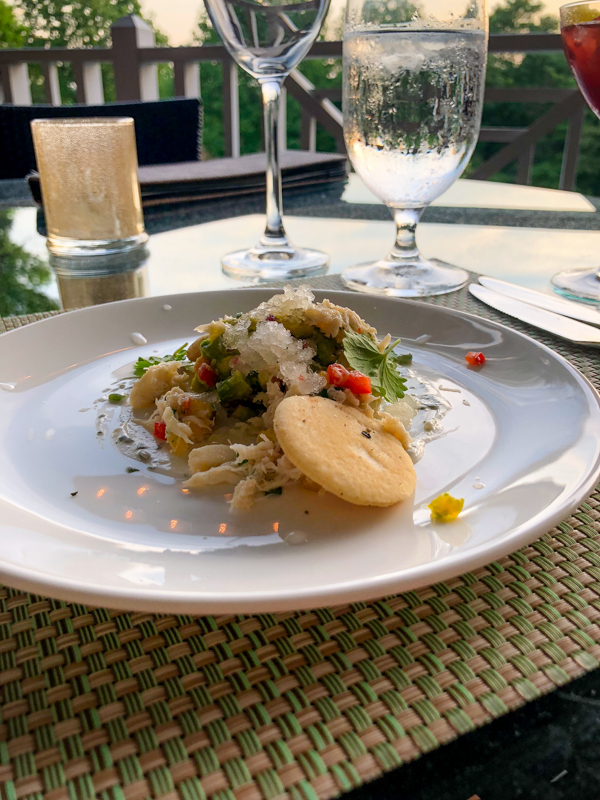 It was a great dish! Sunday morning I got to sleep in a bit, as Mazen spent the night with Matt. Thomas brought me coffee in bed (which he actually does every morning!) 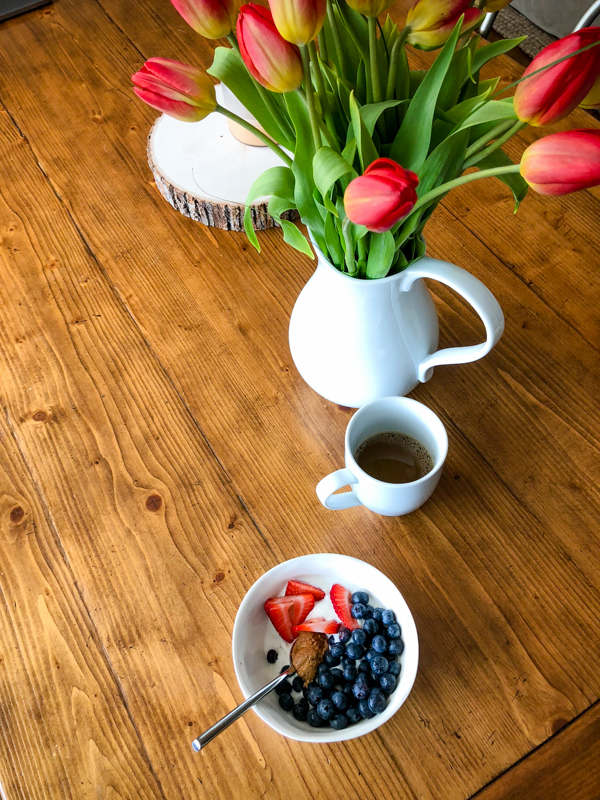 and then I came down to flowers, a card, and some breakfast. 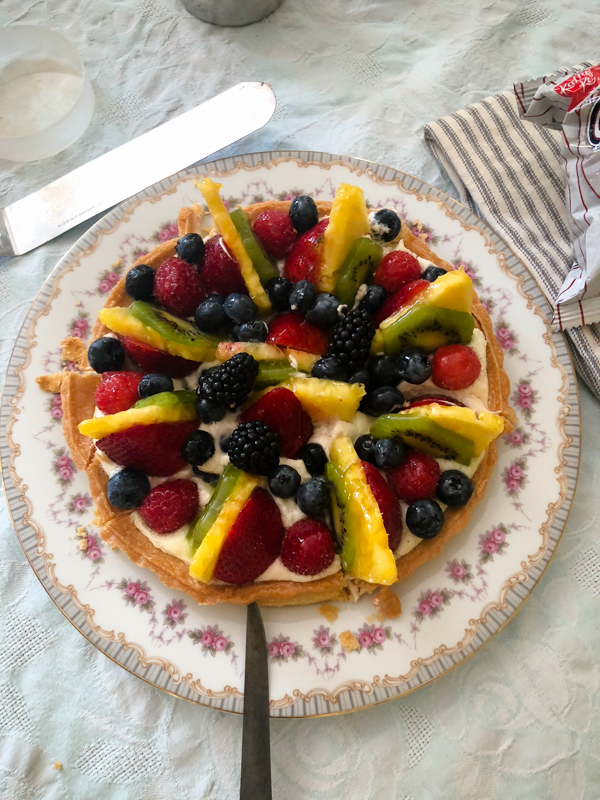 After showers, we headed out to North Garden for brunch with the Donnes. 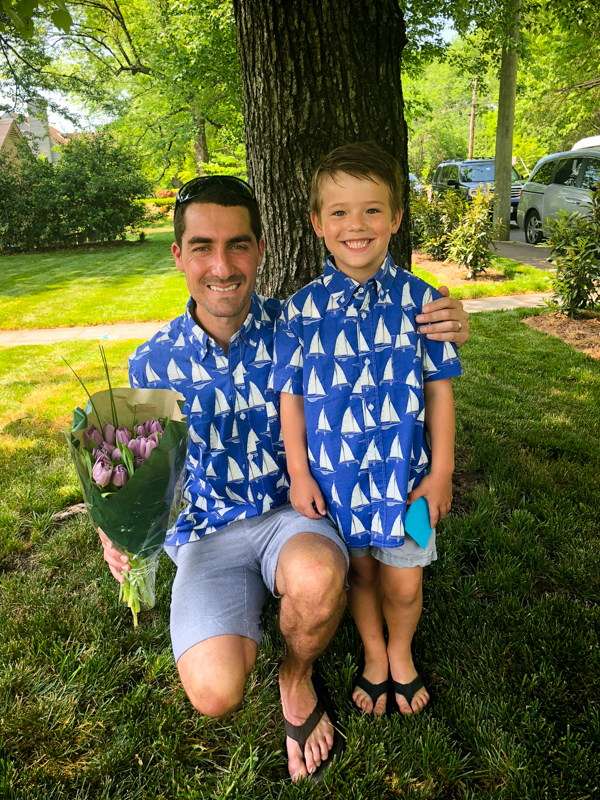 I got the boys matching shirts on sale for super cheap at J Crew Factory (one at the mall here and ordered one online). They’re mainly to wear on a beach vacation, but I requested they test them out on Mother’s Day. Don’t they look dapper?! 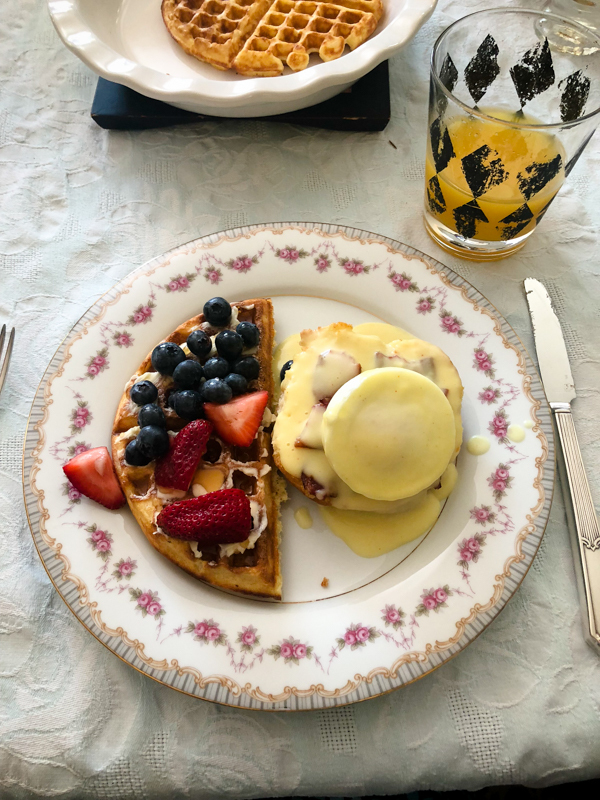 We had a lovely brunch at Nona and John’s including eggs Benedict on Timbercreek biscuits with homemade hollandaise and John’s famous waffles! 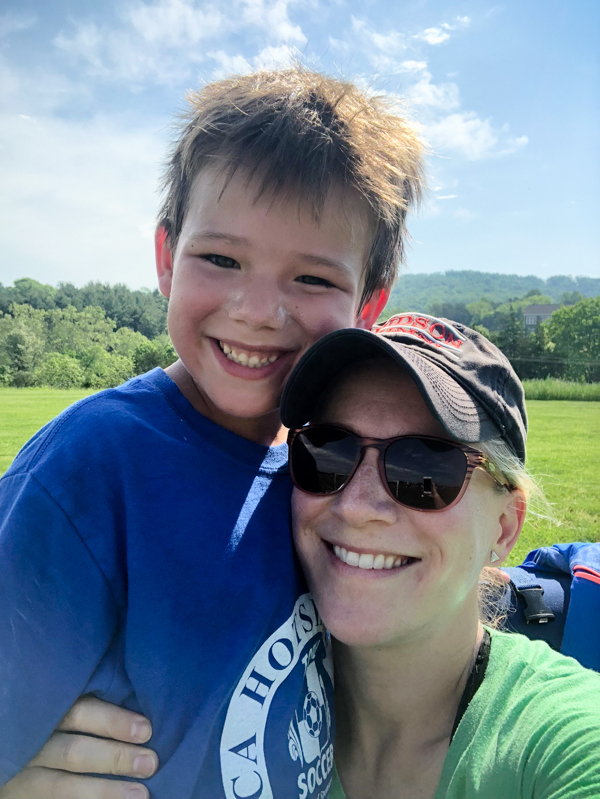 T’s parents had 100 water balloons and super soakers for the boys – they had a blast getting wet after lunch! 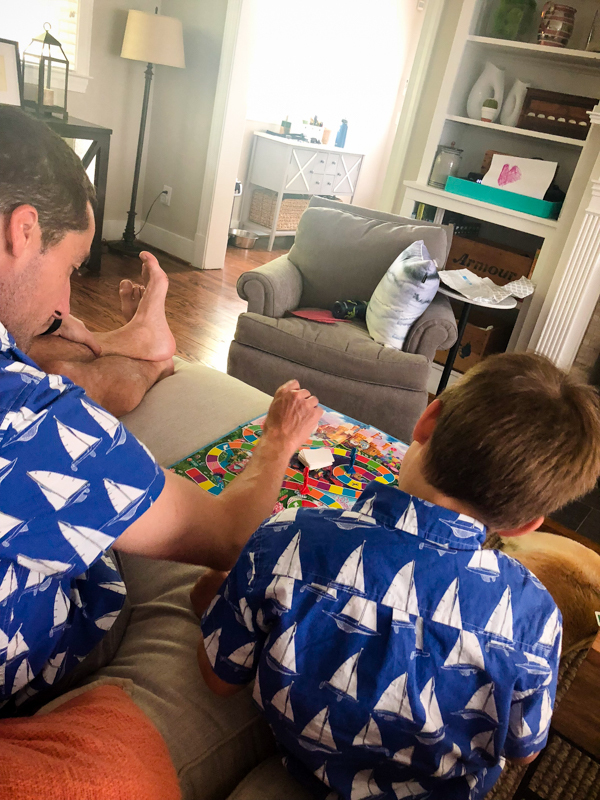 We went home to rest up for 20 minutes with a quick game of Candyland before Mazen and I headed back out to the local elementary school to see the musical Annie! Annie is one of my all-time favorite musicals/movies, and Mazen did well sitting through the show. We ended up leaving at intermission because he was getting pretty itchy when the adult-heavy part of the show began, but we still got a great taste of the performance. There were so many cute kids in the show! 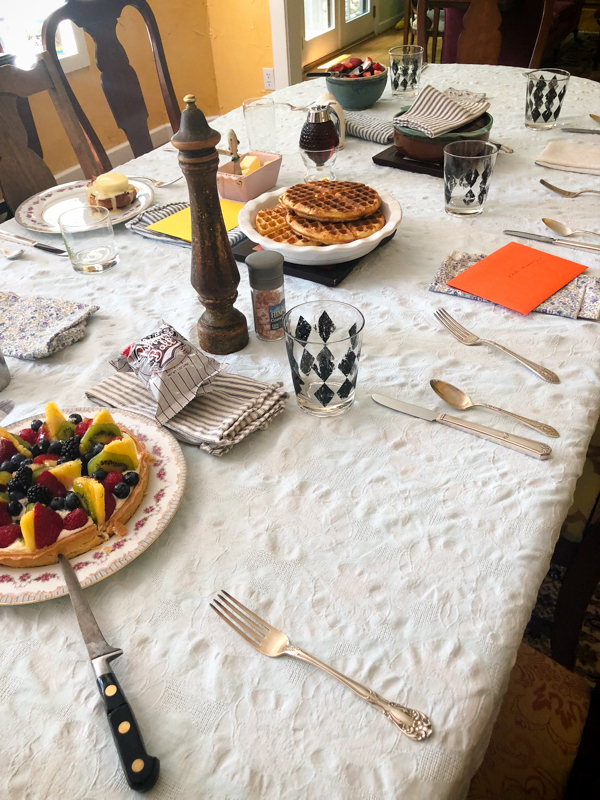 The post Selling Nesting Dating Brunching appeared first on Kath Eats Real Food.